Use automated analysis to pull more value out of your digital part data. 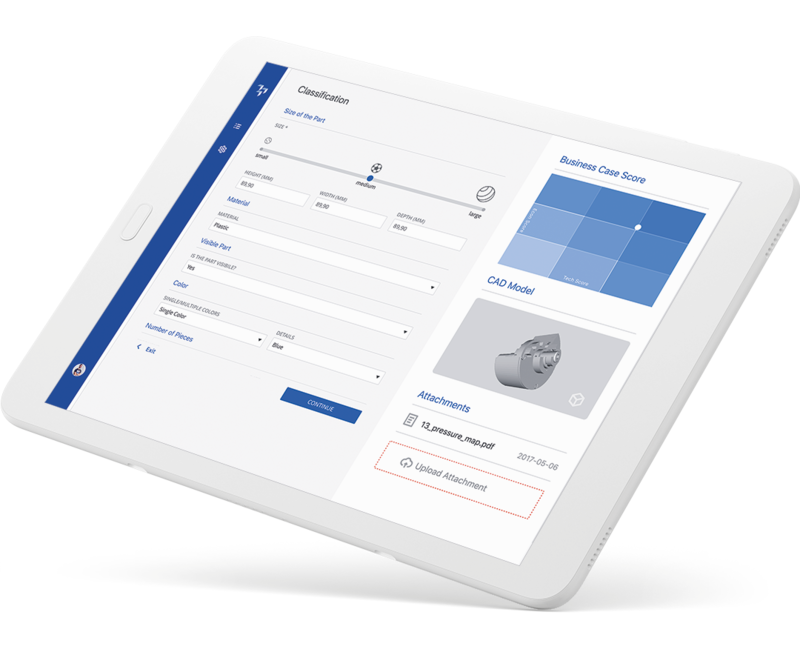 Connect your ERP or SAP inventory to our AM Part Identifier and use market-validated algorithms to shine a spotlight on which parts are ready for additive manufacturing. Want more Value from your ERP data? AMPI can help your business increase additive manufacturing from any stage. The software can work with ERP data or PLM data to provide recommendations of your ideal AM business cases. We built the AM Part Identifier to directly connect to your internal systems including SAP and other internal ERP databases. As the part information is updated it will update in AMPI automatically. This gives your team the ability to evaluate business cases as the scenario changes in real time. The analysis results can also be synchronized back into your ERP system. Working with leading AM consultants, we established 15 criteria and a recommended value weighting to begin sorting your part inventory right away. Based on your specific business scenario, the relative importance of each criteria can be configured to tailor to your specific business scenarios. When you encounter scenarios that are not covered by our best-practice criteria, you can define additional criteria to enhance the algorithms and add a higher level of accuracy to inform your decision making. Until now, the growth of your additive manufacturing was limited by the speed at which experts could identify new use cases or your design and engineering teams could finish new designs. AMPI gives you a third option, data-driven business case recommendations based on the part details that you already have on hand. Not only can AMPI process your entire dataset in one pass - your experts can quickly adjust the evaluation criteria to the specific production scenario to make good decisions. Organizing information about part suitability into concise and accurate reports is a quick way to multiply the effectiveness of your AM team. AMPI combines technical requirements with part geometry to determine if it a true AM business case. This includes aspects such as part quality, performance, mechanical stresses, exposure to the elements and being included in assembly groups. The production scenario for each part has a large impact on their suitability as an AM business case. AMPI analyzes those factors such as total part quantity, change frequency and logistic costs to find the best candidates for additive manufacturing. Your ERP system tracks the reality of your business to make good business decisions. AMPI can integrate that information into how you make decisions on AM parts. Using the direct connection means that this valuable data is always up-to-date to make the best possible decisions. Your team can add threshold triggers to capture when parts become good candidates for AM. As a part crosses this point during its lifecycle AMPI will notify your team to reexamine that part. Those thresholds can be adjusted at any point based on single parts or categories of part types. Use AMPI to get more Value from your Digital Data. Your ERP database already holds all the information you need to find new AM business cases. AMPI gives your team a way to structure and leverage that data to reveal what items can shift from conventional to additive manufacturing. Simply connect AMPI to your existing part inventory. The AM Part Identifier will then analyze every part’s metadata to show you the top business cases for additive manufacturing automatically. Not an AM use case, yet? By linking AMPI to an active database, you track the suitability of every part through its entire Part Life Cycle. AMPI will show you the exact point when a part is ready for additive manufacturing. Help your team focus on the right parts for additive. Your company is investing in additive manufacturing and you have the opportunity to grow your production volume with high-quality AM applications. AMPI’s Inventory Analysis quickly reveals the new parts that you should add to your AM production. Having a large backlog of parts to select from also helps you fill build jobs to maximum capacity another key factor in profitability and raising the production volume. The inventory analysis points your procurement directly to the parts with the highest potential to add cost savings and create more secure procurement pathways using additive manufacturing. Over time, they can utilize triggers to highlight parts that are about to cross from conventional manufacturing into being more profitable to produce using AM. The AM Part Identifier is ready to connect directly onto the 3YOURMIND Enterprise and eCommerce AM Workflows. This allows your AM expert team to transfer parts with a strong analysis score directly into the pricing and ordering ecosystem of your company - with a single click. Additionally communication around the project can be continued between your procurement team, product owner and production floor directly alongside the digital information. Are you ready to start taking advantage of the most complete end-to-end AM workflow on the market? AM-ready parts already exist in your company’s digital data. What are you waiting for?